Our famous Timber-Talker complemented by a beautiful Stainless Steel Band is a Show Stopper indeed! The “All-Duck-All-the-Time” duck call, our Timber-Talker is made for situations where perfect mallard sounds, at real duck volumes RULE! 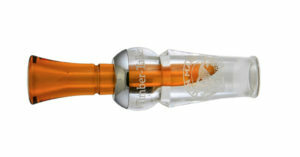 From smooth seductive highballs to fat feeding clucks, and whisper quiet quacks, Timber-Talkers are perfect for situations where a call that is too loud echoes and flares ducks. They produce perfect hunting volume, a nice ring if you need it to get the birds’ attention, then flat-quiet talk to “finish” the birds. A modern classic! Precision-turned from cast acrylic, each call is hand polished and tuned by Sean Mann. A true timber call, it can command birds or finesse them interchangeably. Our “Easy-Tune Reed System” makes cleaning and tuning a snap!